Grade Level or Age Group: I have used this approach with adults involved in RCIA. What follows is adapted for catechists and religion teachers. It could certainly be adapted once more for high school students. 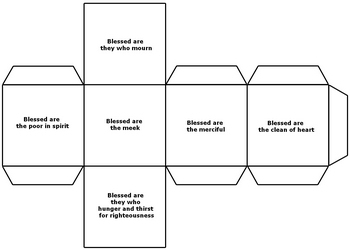 Lesson Objectives: The participants will be invited to reflect on the beatitudes as blueprints for discipleship. 2. Read "Clones of Jesus". 3. Post an enlarged copy of the Beatitudes so that the students can read it or hand out copies to the participants. 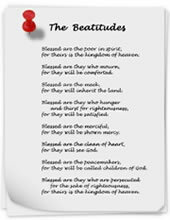 You could also use one of the Beatitudes posters available on the Resources for Catholic Educators Web site. 4. Hand out the Reflection on the Beatitudes worksheet: invite the participants to take a few quiet minutes to answer the questions and to write a brief prayer. 5. Invite the participants to share the answers to the questions if they feel comfortable doing so. 6. Invite the participants to read out their prayers - again only if they feel comfortable doing so. This can be your closing prayer. a . Download this beatitudes handout with a crossword puzzle, a wordsearch and a jigsaw puzzle activity. b. 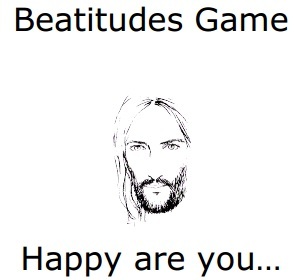 Have the children play the Beatitudes game. Download the rules and game material. ©Gilles Côté, 1999-2018 - Please feel free to copy and use this material for non-profit educational purposes. Please acknowledge your source if you do so.